Tropical Storm Mujigae hovered over the South China Sea, just west of Luzon, on September 9, 2009. The same day, NASA’s QuikSCAT satellite observed the storm’s wind speeds and directions over the water. In this image, color codes indicate wind speed, with charcoal gray being the lowest, yellow to red being intermediate speeds, and purple being the highest. Barbs indicate wind direction, and white barbs show areas of intense rainfall. The land area of Luzon is masked out in dark gray (land) and light gray (land and water mix). Like most storms, Mujigae has the most intense wind speeds near the center and less intense wind speeds around the edges. The predominating wind speed appears to be around 25–30 knots (roughly 45–55 kilometers per hour). Because hurricanes are relatively rare, wind speeds above 50 knots (about 92 kilometers per hour) are not thoroughly calibrated in QuikSCAT measurements. According to a report from the Joint Typhoon Warning Center at 15:00 UTC (11:00 p.m. Manila time) on September 11, 2009, Mujigae had traveled westward toward Hanoi, Vietnam. The storm had maximum sustained winds at 30 knots (55 kilometers per hour), with gusts up to 40 knots (75 kilometers per hour). As of 12:00 UTC, maximum significant wave height was expected to be 2.7 meters (9 feet). According to a report from Xinhua News, more than 163,000 people were evacuated in Hainan, Guangdong, and Guangxi in anticipation of the storm. NASA image courtesy of David Long, Brigham Young University, on the QuikSCAT Science Team, and the Jet Propulsion Laboratory. Caption by Michon Scott. 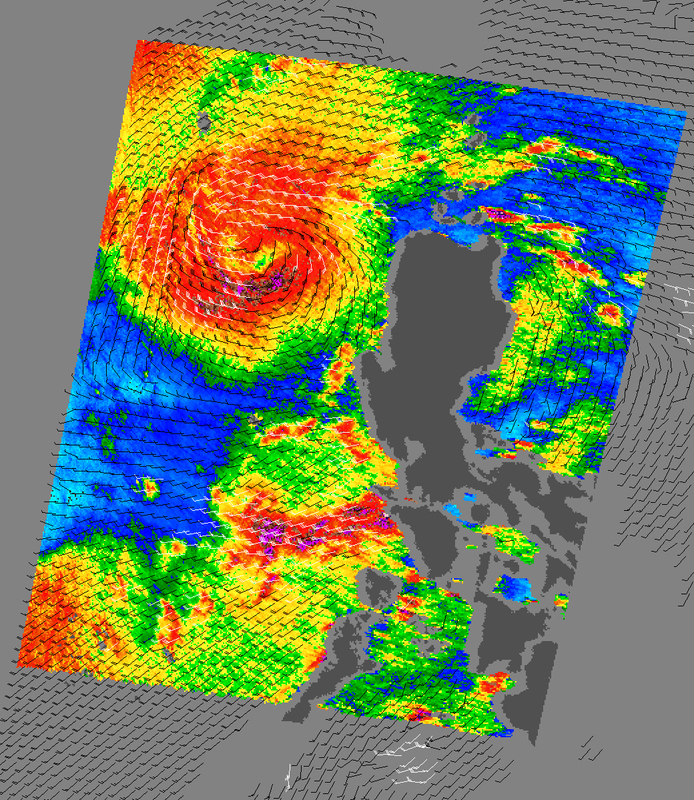 Acquired September 9, 2009, this image uses color coding and barbs to indicate wind speed and direction for Tropical Storm Mujigae. 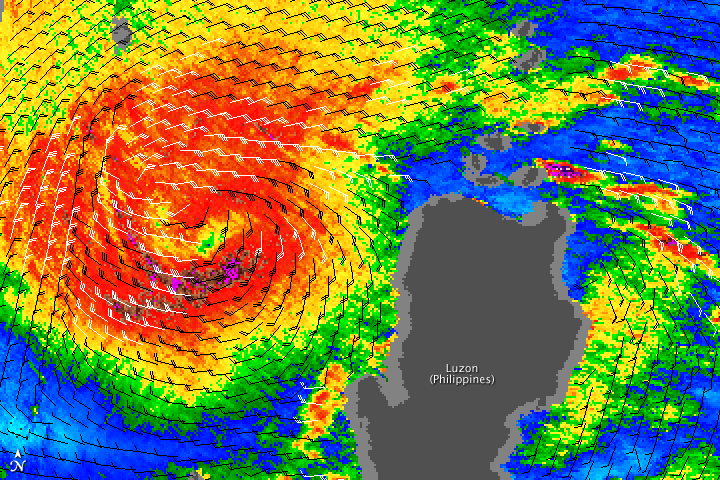 The image captures the storm center immediately west of the Philippine island of Luzon. Joint Typhoon Warning Center. (2009, September 11). Tropical Storm Mujigae. Naval Maritime Forecast Center. Accessed September 11, 2009. Xinhua. (2009, September 11). More than 163,000 evacuated in south China as Mujigae lands. Accessed September 11, 2009.